IT Managers that have selected a SAN to host their virtualized environment have a unique challenge; How to provide NAS services for users in a way that will effectively leverage the capabilities of the SAN investment. There have been traditionally three potential solutions, adding a separate NAS platform, using a hardware NAS gateway or using a general purpose OS running as a virtual machine. Now though thanks to virtualization and the power of the cloud there is a fourth option, A Virtual NAS Filer. In this seminar, George Crump lead analyst at Storage Switzerland, will cover the pros and cons of each of these methods to help you decide what makes the most sense for your environment. 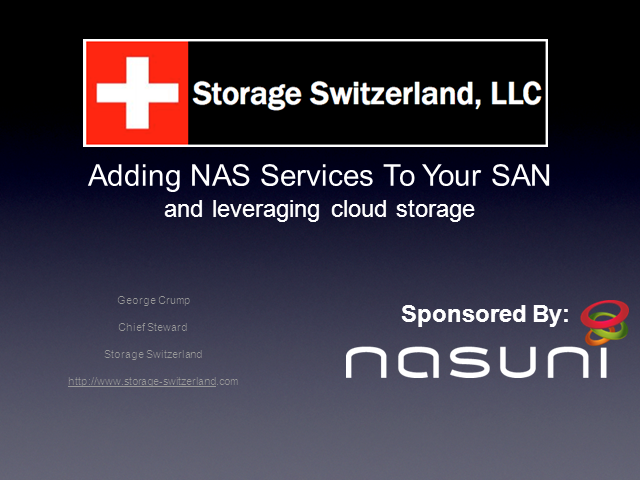 Then Andres Rodriguez, CEO of Nasuni will describe how their Virtual NAS service works and might help you solve this important challenge.